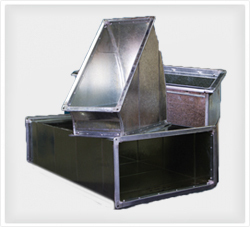 Galvanized Iron (GI) Ducts are manufactured at our State-of-the-art factory as per customer requirements. All the accessories such as fittings, attachments, components, and other goods are manufactured from the finest grade of material and cutting edge technology. Our quality controllers check each and every detail on well defined quality parameters. Competitively priced, if need to be, the offered range of ducting is also facilitated with sound proofing and high degree insulation. In order to re-inforce, all straight ducts have beading all along at a distance of 300 mm between them. KAD’s mild steel ducts (MS Ducts) are fabricated from hot rolled or cold rolled black steel sheets with fully welded construction to achieve leak proofing. 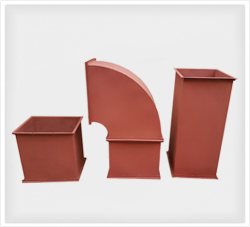 MS ducts are mainly used for the kitchen exhaust because of its inherently fire resistant characteristics. The fire resistance characteristics of MS ducts can be further enhanced by Fire Rated Spray Coat or painted with multiple coats of Red Oxide along with Rock wool insulation conforming to NFPA 96 Standards. KAD’s SS ducts are fabricated out from prime SS sheets of 316 / 304 grades with fully welded longitudinal and transverse joints. KAD is experienced in manufacturing round as well as rectangular stainless steel ducts, Dedicated team of engineers and technicians are involved in manufacturing process. 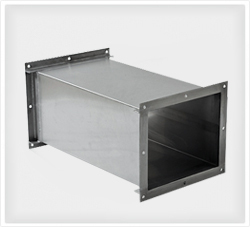 Stainless steel Ducts are manufactured as per NFPA, BS and ASHRE standards. Stainless Steel ducts are mainly used for Kitchen exhaust in exposed to view areas and in the areas where Hygiene is the top priority and in highly corrosive environments. 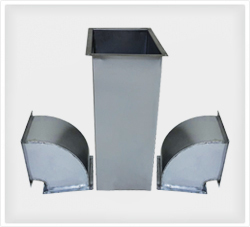 Stainless Steel ducts have higher strength, rigidity and best finish in comparison with GI ducts. Its appearance though is much sleeker than the one in an aluminum duct it stands way out for its corrosion resistant characteristic. For SS Ducts stainless steel sheets are available in two qualities i.e. Grade 316 & Grade 304. KAD is experienced in manufacturing aluminum round as well as rectangular ducts. Material is as specified in ASTM B209, BS.EN485, BS.EN515, BS.EN573 depending on the exposed environment. KAD’s Aluminum ducts are fabricated from aluminum sheets of AA1100 / Equal grade of sheets with Hemmed ‘S’ & Drive ‘C’ cleats or FL flanged type transverse joints. Plain type (Reflector finish) is also widely used as air ducts in areas such as swimming pool, clean rooms of sensitive/industrial films etc.